The highest calling of a believer is to know the God of the universe. In His grace, our Creator has not left us to make guesses about who He is and what He is like, for He has revealed Himself and His character in His Word. In this series, Dr. R.C. 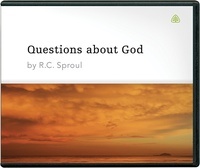 Sproul looks at several common questions that believers have about God. Turning to Scripture, Dr. Sproul answers these questions and explores what the Lord has said about His various attributes.